The vraja-gopi Dhanishta devi, who had previously fed Lord Krishna with limitless opulent foodstuffs, appeared as Sri Raghava Pandita, in Mahaprabhu’s pastimes. And the gopi named Gunamala had appeared as Raghava Pandita’s sister Srimati Damayanti devi. Raghava Bhavan ,the residence of Sri Raghava Pandita and Damayanti, is renowned all over the three worlds as the eternal residence of Sri Gaurahari (As described below). Lord Gaura Nitai have manifested their innumerable heart rending pastimes over here at Raghava Bhavan (500 Years ago). 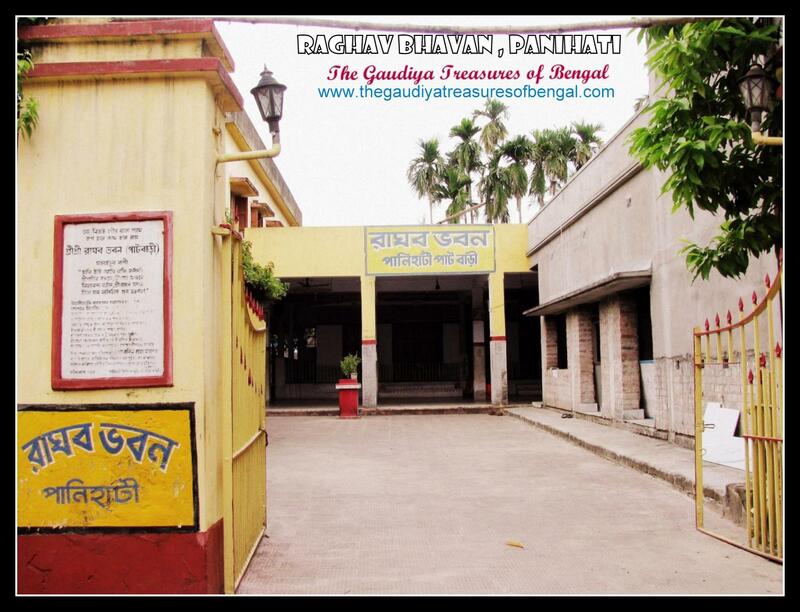 Located on the bank of the Ganges at panihati, Raghava Bhavan is very well connected to Kolkata, via road, railways and waterways. 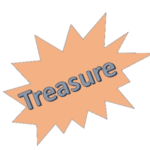 In Krishna’s Vrindavana Pastimes,mother Yashoda would order Dhanishta Gopi to carry Krishna’s food remnants to Srimati Radharani .Radharani would then relish the remnants (prasada) of Her beloved Lord. Similarly, in Mahaprabhu’s pastimes, Lord Caitanya who would always remain immersed in the mood of Srimati Radharani, would lovingly accept the prasadam brought to Him by Sri Raghava pandita, the incarnation of Dhanishta Gopi. In Caitanya Caritamrta, it has been revealed that Sri Raghava Pandita was an intimate associate of Lord Caitanya and is said to have been the seventh branch of Mahaprabhu’s desire tree of devotional service. After accepting His sannyasa, Lord Caitanya had moved over to reside at Jagannatha puri. 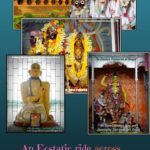 Every year, during the Ratha yatra festival, almost all the devotees from Bengal ,led by Sivananda sen, would travel to Puri to reunite with Lord Gaurasundara once again.Srimati Damayanti Devi would cook innumerable items for Mahaprabhu with her love and devotion, and thereafter pack these in separate bags. Raghava Pandita, would then carry these bags to Puri during his annual visit and offer them to Lord Caitanya. 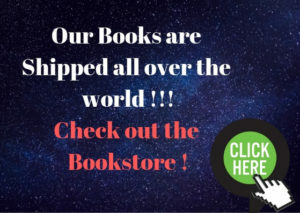 These bags of delicious food items came to be subsequently known as Raghavera Jhali (the bags of Raghava Pandita) and they find a very special mention in Sri Caitanya Bhagavat and Sri Caitanya Caritamrta. 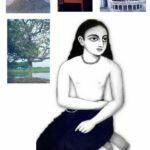 – Then Lord Nityananda arrived at the residence of Purandara Pandit in Khardaha village. Here at Khardaha,He had manifested so many innumerable ecstatic dancing pastimes, that it is impossible for one to recount all of them. 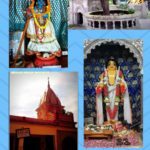 The holy dham of Khardaha is located hardly at a distance of 20 kms from kolkata.The land of merciful Nityananda Prabhu is decorated all over with various wish fulfilling trees that readily bestow pure devotion upon all without any discrimination. Various demigods have been waiting and meditating for millions of years desiring to take birth in the transcendental abode of Khardaha, where they shall be able to associate with the Lord’s pure devotees and obtain the dust from their lotus feet.The land of Khardaha is a witness to Lord Nitai’s ecstatic pastimes, merely contemplating upon which ,one easily gains entry into the realm of transcendence.Srimati Jahnava Devi, Vasudha devi, Birchandra Prabhu have all manifested their sweet pastimes here and sanctified this holy tract of land. 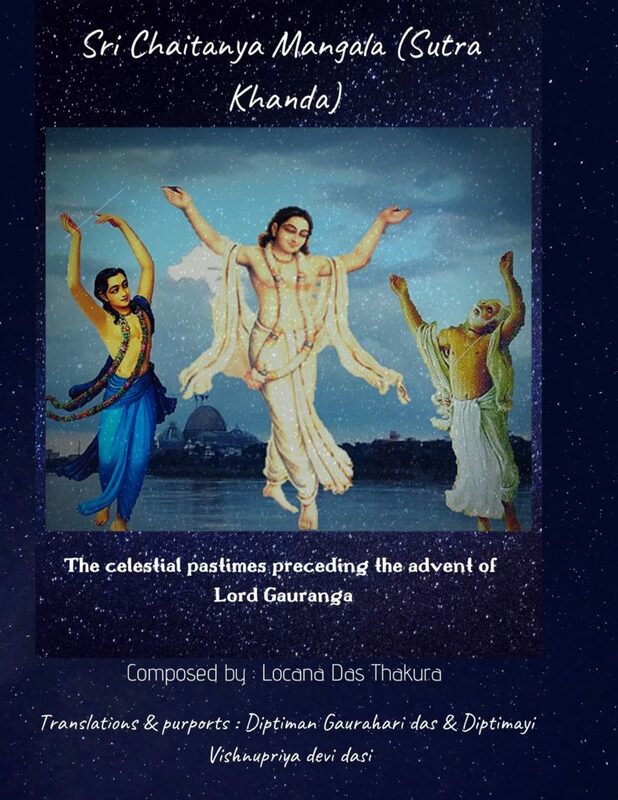 ‘The Gaudiya Treasures of Bengal’ is exceedingly blessed to have been able to visit Khardaha and take darsana of Kunja Vatika where Nityananda prabhu manifests His eternal pastimes. 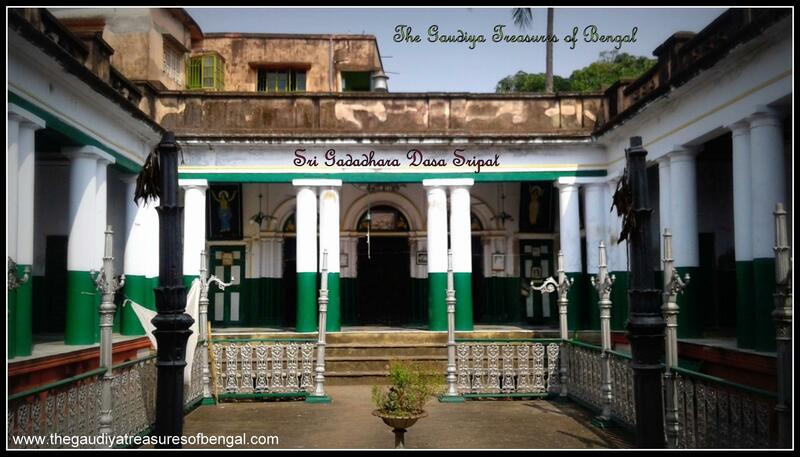 The Krishna Raya temple is one of the biggest in Bengal and is one of the most significant for the Gaudiya vaishnavas. It is situated in a spacious compound ,adorned with beautiful gardens ,with high boundary walls on its four sides. The temple today also houses a big kitchen along with residential quarters. Sri Nimai Mullick, the then prominent zamindar of kolkata, is said to have seen the broken down temple while he was on his way to Benares (refer – ‘The pious Mullicks of Bengal’). The pious zamindar thereafter reconstructed the temple and arranged for the proper worship of the deities in the year 1786 AD. Sri Krishna Raya are the worshipable Radha Krishna deities of Sri Srinatha Prabhu, the spiritual master of Kavi Karnapura, the third son of Sivananda Sen.Kavi Karnapura does not reveal the original identity of his spiritual master,Sri Srinatha Chakravarthy, in his book Sri Gaur Ganoddesha Dipika. 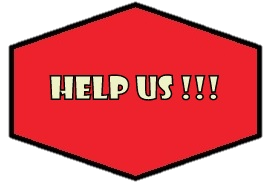 The reason being that a disciple should not address his spiritual master by his name. 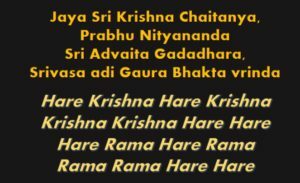 Srila Krishnadas Kaviraj Goswami highly glorifies Sri Srinatha Prabhu in his Caitanya Caritamrta and reveals that he was blessed by Mahaprabhu and that his love for Krishna mesmerized all the three worlds (Srinatha paṇḍita Prabhura kripara bhajana, yanra Krishna-seva dekhi vash tribhuvana).Srinatha Chakravarthy was a disciple of Sri Advaita Acharya. 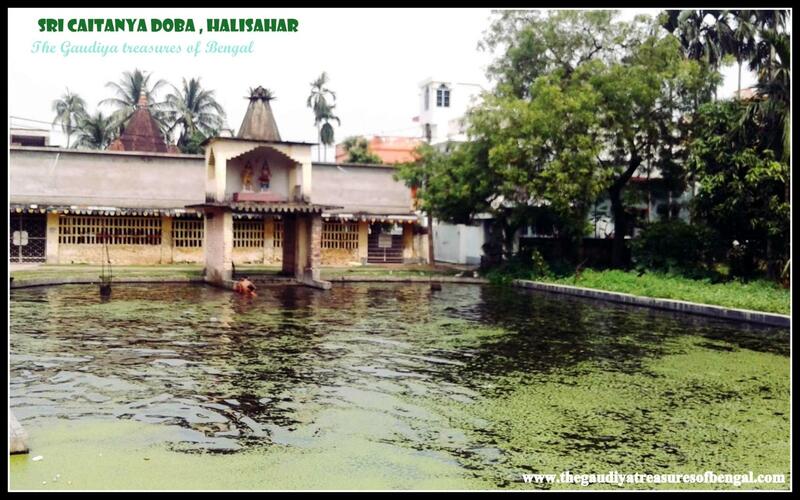 The birthplace of Sri Isvara Puri, the spiritual master of Sri Caitanya Mahaprabhu, is popularly known today as ‘Caitanya Doba’.The word doba means ‘a pool of water’. When Caitanya Mahaprabhu travelled through Halisahar(kumarhatta) on His way to Puri, He showed respect for His spiritual master by picking up some earth from the place of his birth, wrapping it in His cloth and keeping it carefully with Him. He used to eat a small portion of this dust daily.Thousands of pilgrims have since followed His example, thus forming a pit that has since filled with water (as visible in picture).Just opposite to Caitanya Doba is an ashrama (the yellow building visible in the picture), where devotees reside and serve the sacred dham.The team from ’The Gaudiya Treasures of Bengal’ considers itself exceedingly fortunate to have been able to visit and pay our obeisances unto this ancient sacred pilgrimage site. Talking to the local devotees, we came to know that a huge festival takes place here every year, during the month of October-November, to commemorate the arrival of Lord Gaurasundara at Caitanya Doba, who is believed to have arrived during this time of the year. 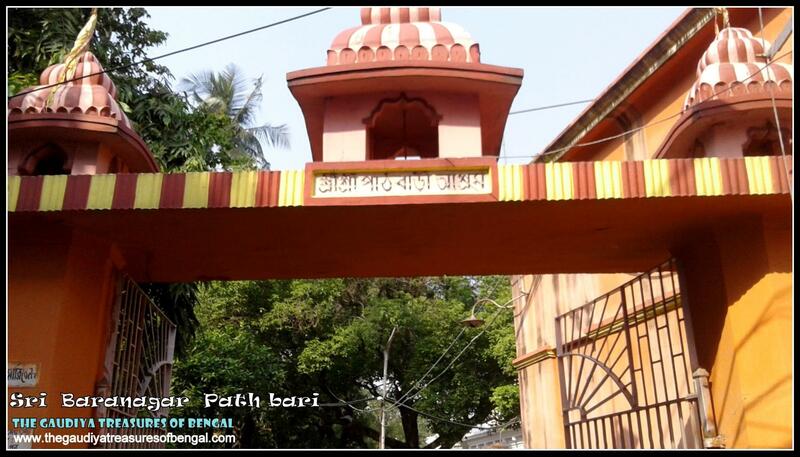 Sri Isvara Puri had been the most prominent disciple of Sri Madhavendra Puri. He spent most of his time residing at his guru’s ashram in Gaya. Caitanya Mahaprabhu met Isvara Puri at the Vishnu Temple in Gaya, and accepted Vaishnava initiation from him. 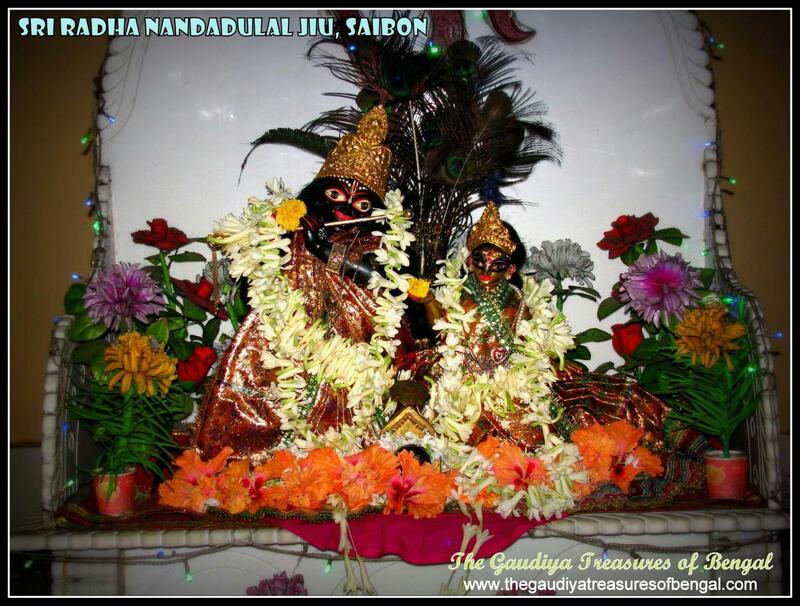 The stone that remained, after giving shape to Syamsundara jiu , was used to carve out two more enchanting deities – sri Nandadulal jiu who was installed at swamibon (present saibon) and Vallavaji who was installed at Vallavapura (present serampore). 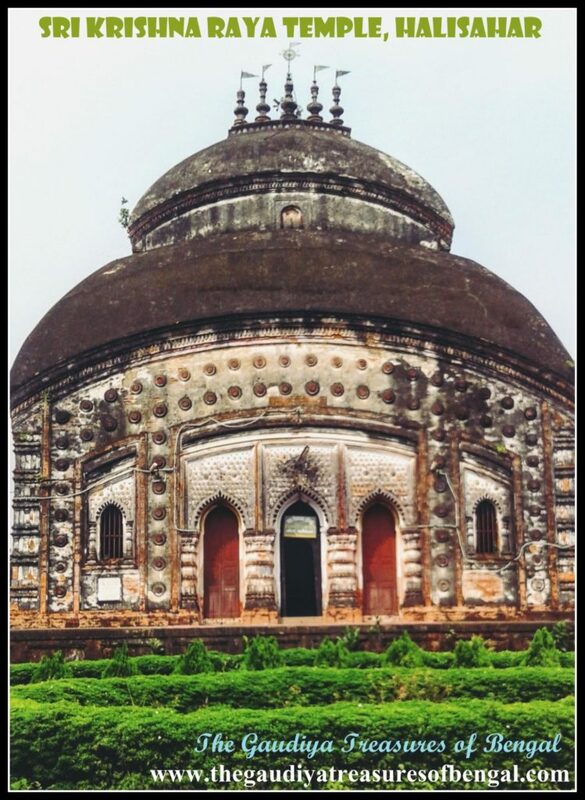 The abovementioned verse reveals that Sri Nanda dulal jiu was fashioned from the same stone (sila) which was brought by Sri Birchandra Prabhu from the nawab’s palace in Malda. 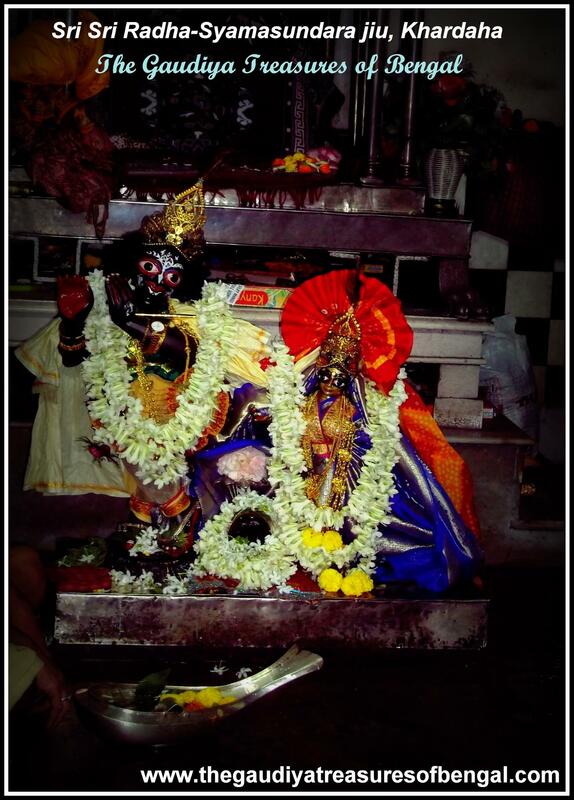 The other two enchanting deities that were carved out from the same stone being Sri Radha Syamasundara jiu, who presently resides at Khardaha and Sri RadhaVallav jiu, who is installed at Serampore (Hooghly, West bengal). According to the hearsay,the great devotee Sri Madhu Pandita, who also hailed from Saibon, used to worship our beloved Radha Nandadulal jiu ,before he shifted to Vrindavana.Sri Madhu Pandita and Paramananda Bhattacharya, were later instrumental in discovering the deity of Gopinatha jiu in Vrindavana. The deity of Gopinatha jiu which had been originally installed five thousand years ago by Lord Krishna’s great grandson Vajranabha, and which was lost in the due course of time, was rediscovered in the holy land of Vrindavana few hundred years ago by these two stalwarts. This has been confirmed in Bhakti Ratnakara as well. 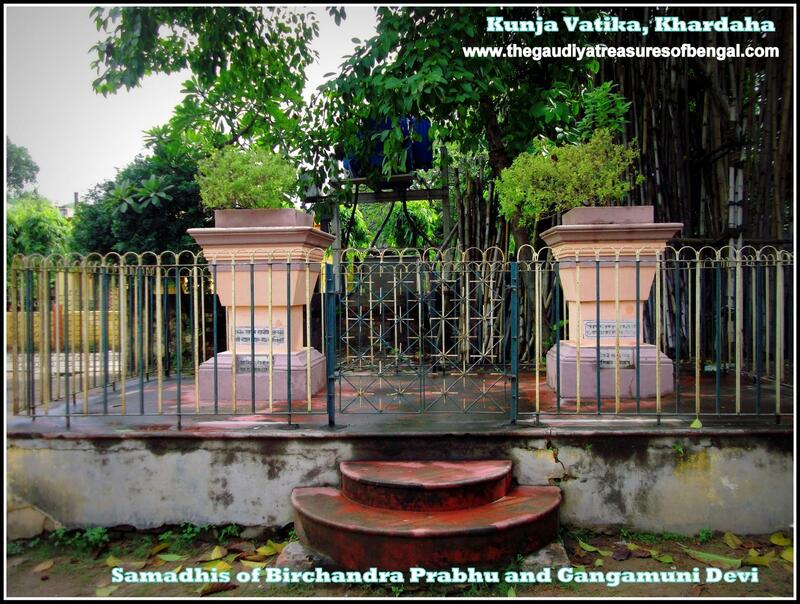 As discussed in detail in the article entitled -’Sri Sri Radha-Syamasundara temple, Khardaha’, Sri Birchandra Prabhu, the son of Lord Nityananda, and the dear disciple of Jahnava Mata, persuaded the king of Bengal to part with a stone from his palace, which happened to be a very sacred Saligrama Sila, out of which these three beautiful deities were subsequently sculpted.Please refer to that article to relish the beautiful appearance pastime of these three mesmerizing deities.